In the last year I’ve started to get a lot of questions about blogging. Whether you haven’t even started a blog or if you’ve been blogging for awhile, this list is for you. 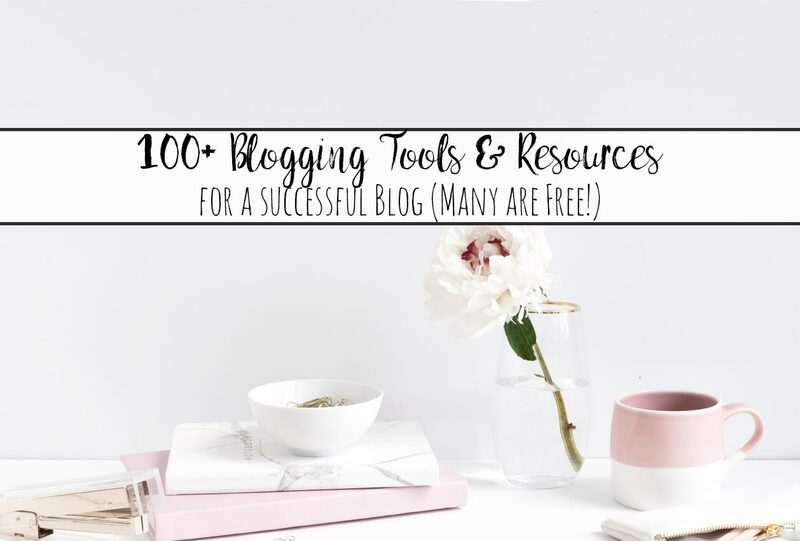 I’ve gathered the most fabulous, tried and tested, tools and resources YOU need to help you become a successful blogger. They’re divided by category. I’ve also included prices- though many are free- as well as notes and tips for you to get the most out of the them. I put a major emphasis on FREE! Some cost money- good blogging resources often do. But if you’re looking for where to find free images, which free plug-ins you can use, and more, this is the post for you! There is a lot in this post, but I did my best to sort it by category. So don’t just scan the first section and say “I don’t need this.” Keep scrolling. You might be amazed by what you find. Also, please leave a comment with any resources that you love that I might have missed! I’m always trying to improve my posts to provide the most value for my readers. Note that this is NOT an exhaustive list of every option available blogging resource-wise. I stuck with resources I’ve either used personally, experimented with, or have trusted friends recommend. 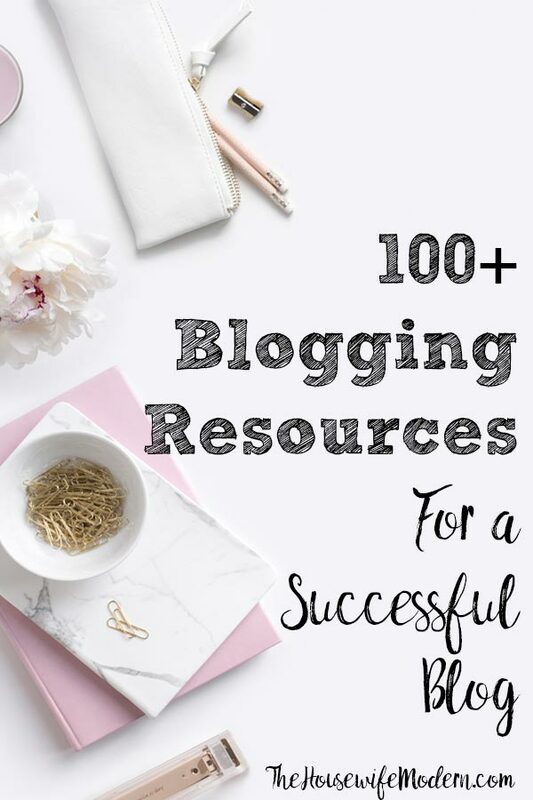 My goal here was to hit resources that cover a variety of areas of the blogging world- from SEO to graphics- not to provide the most exhaustive list of resources out there. I also haven’t gotten into video editing, yet, so my resources for that are non-existent. For right now. Check back in 2019, though, and I’ll have done my research! (haha). Also check out the “Blogging Resources” page. One page dedicated to everything blogging! 1. How to Start a Successful Blog: The Ultimate Guide. FREE. This is a post…well, it’s more of a mini-book…with everything you need to set up your blog. It includes free printable worksheets for various sections. It will help you pick a niche, set up your site, and more! 2. WordPress.org. FREE. You want to set up your site on WordPress.ORG (note the .org, not .com). I can’t emphasize this enough. It’s number one for a reason. If you try a free site, such as Blogger, or a site where they help you set up, such as Wix, you may have trouble working with brands and monetizing down the road. Don’t go to all the effort of setting up a site only to have to change it. And, yes, that is personal experience speaking. I started on Weebly. Which is great for a hobby blogger. But not a professional one. 3. Understanding WordPress Course. FREE. By Grayson Bell. If you feel you need help in navigating WordPress, this free course is a great place to start. 4. Bluehost for hosting. $3.95/month. Yep, it’s really that cheap. And it’s who I used until I broke 75,000. Then I had to upgrade to a more expensive service. But for those at the beginner and intermediate level, this is who I use and who I recommend. Their price can’t be beaten and I’ve only had trouble once with customer service. And that was one rep. When I reconnected with someone else, they fixed the issue (applying an SSL back in the day before they were required) immediately and apologized for the previous rep.
A quick note before we get to themes: If I’m recommending them below, it’s because I’ve had positive feedback from others about them. I’m not recommending anything that I haven’t had blogger friends rave about. That’s why there are only a few companies listed below. I am specifically NOT recommending Theme Forest or Themify. I’ve heard complaints about things ranging from security loopholes to some themes being of extremely low quality. That isn’t true for all the themes on their sites and companies change over time (they may get better). But I’d rather you were safe than sorry. 1. How to Choose a WordPress Theme: Everything You Need to Know. FREE. This is a post with everything I wish someone had told me before I actually spent money on a theme. 2. Mojo Marketplace– Price: $39-69. Mojo has thousands of themes. I personally use the Creativo Theme by Rocky Themes. It’s a wonderful theme…but it has too many options that I don’t need. If I ever get around to a redesign, I’m going to go with a lighter theme. The theme itself is beautiful, easy to customize, etc. In fact, I’ve put off a redesign for over a year because I love it so much. 3. Elegant Themes– Price: $89/year or $249 one-time lifetime access. If you want a stand-alone theme (that doesn’t require Genesis framework), than Elegant Themes is a good place to start. One of their themes is Divi, the “most popular premium WordPress theme in the world.” Just keep in mind that if you go with a stand-alone theme, it will be harder to change in the future. Whereas if you go with Genesis framework and a child theme, you can change the child theme with minimal hassle. 4. StudioPress– Price- $129.95 for theme and genesis framework. This is my number one recommendation. It was StudioPress who developed the Genesis Framework (which is backed by WordPress founder Matt Mullenweg). So going with Genesis framework and one of their child themes is always a great idea. In fact, the other two sites I’m going to recommend use their Genesis Framework and provide you with child themes. 5. Restored 316– Price $75, but you also need Genesis framework ($59.95). This is another place I highly recommend. I have a ton of blogger friends who use their themes and love them. 6. Pretty Darn Cute–Price: $49.99-$75.00, but you also need Genesis framework ($59.95). This is the final place I recommend. I have a few friends (this is a smaller company) who have gone with them and have been very happy. Getting WordPress set and your blog set-up is just the first step in a successful blog. The next step is often finding out which plug-ins work and which you don’t need. Here are the ones I’ve found particularly useful and/or have been recommended by others. ~Also check out “20 Free (or almost free) WordPress Plug-ins” by Ruth Soukup. 1. WordFence. Price- Free for basic, 8.25/month for premium. This is for security for your website. Don’t think you’re too small to get hacked. I thought that. I was wrong. 2. Vaultpress. Price- $39/year for personal (which includes small businesses). This is for backups. They have a fabulous back-up system and are very responsive to any requests for help. I pay the free rather than use a free plug-in simply for their customer service and how easy it is to access backups. 3. Simple Share Buttons. FREE. I use this for social sharing and love it. You can customize which networks are shown and the counts seem pretty accurate. 4. Social Warfare. Price: FREE for basic, $29/year for pro. This is a widely used one, but they have been having a lot of bug issues lately. Despite that, this is the most popular plug-in for social share buttons you’ll run across. 5. WP Recipe Maker. FREE. For food bloggers to input your recipe. I recommend this one because it updates its fields every time Google does so that your recipes are optimized for Google. 6. Askimet Anti-spam. Price: name your price (literally, you can input what you want to pay). I LOVE this for keeping out spam content. 7. Smush. Price: FREE for basic. Reduce your image sizes automatically by installing this plug-in. While I reduce them on my computer as much as possible, I also have this plug-in. 8. 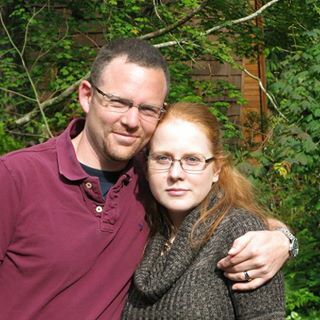 Yoast. Price: FREE for basic, $89/annual for premium. This is THE industry standard for SEO optimization. 9. WP Super Cache (FREE) or WP Total Cache (FREE). Caching supposedly improves your website speed. 10. Tablepress. FREE. Use this plug-in to create tables, such as the one in my post on KitchenAid Mixer Comparison. A nice table provides excellent value to readers. 11. Click to Tweet. FREE. Plug-in allows you to put in a message for your readers to tweet. Yes, Google is taking over the world. In fact, they have so many tools that they’ve earned their own section in this post. 1. Analytics. FREE. You want Google Analytics. Trust me. There are entire courses out there built around the amount of information you can gather from Google Analytics. If you’re just starting out, just install in. You can dive into the data later when you have some traffic. 2. Adsense. FREE. Your first ad income will probably come from Google Adsense. They have no minimum traffic requirements and it’s fairly easy to install. (It used to be easier, but they got rid of the plug-in that did such a fabulous job). It’s free to sign-up for Adsense. I’ve had blogs with zero traffic approved. In fact, I just started a new one that got approved (Walk Into the Bible). 3. Page Speed Insights. FREE. See how fast your site is running and what can be improved. Make sure you check a couple other sites too so you have something to compare against. 4. This isn’t Google…but since we were talking about page speeds. GTMetrix does speed test analyzing. FREE. 5. Google Search Console. FREE. See what keywords you’re already ranking for as well as impressions and a ton of other information. 6. Surveys and forms. FREE. Survey your audience and see what they need/think/want/etc. I used their survey before creating my first product, Life Organized, and gathered a TON of useful information. Or set-up a form to collect required information. 7. Again, this isn’t google…but while we’re talking about surveys. SurveyMonkey. FREE- $37/month, depending on what you all need. 8. Google Drive. FREE. If you use the survey above, it will save it to your Google drive. Some people also share spreadsheets, etc. via Google Drive. 9. Basic Google Search. FREE. If you’re looking for something to link a post to (you should be interlinking all your post), just pick a keyword and type “site:YOURSITEURL KEYWORD” into the search box. It will pull up everything on your site related to that keyword. You might find a perfect post to cross-link to. 10. Google Trends. FREE. If you write current events or want to link a post to a current trending event, this is where to go to see what the world is searching for. (If you’re looking for the Google Keyword Planner, it’s down in the section on “Writing Blog Posts”). 1. 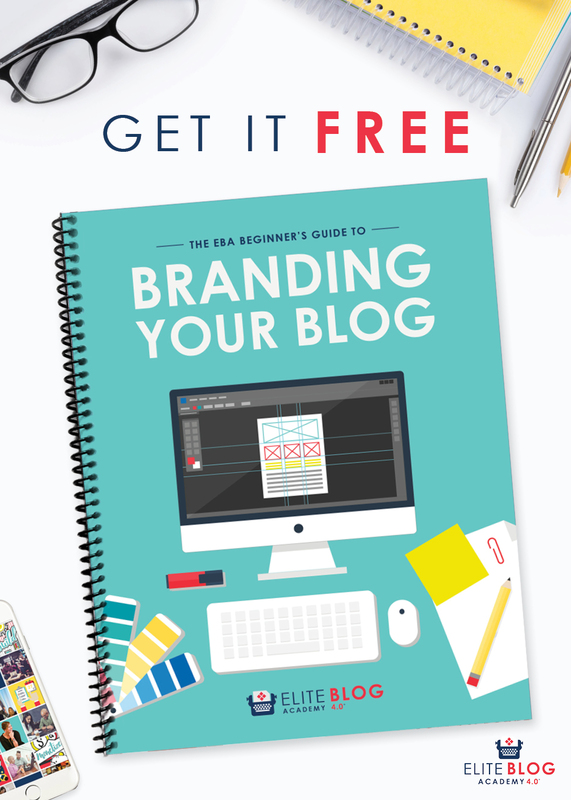 Beginner’s Guide to Branding Your Blog. FREE. Resource on exactly what branding is and how to do it. 2. Moz Domain Authority Link Checker. FREE for 10 checks per month. Check your DA, gets stats related to DA, etc. 3. Paletton– The Color Scheme Designer. FREE. Use to help set up your design/theme colors. Tool allows you to pick base color, then experiment with various options to find colors that work together. An amazing tool and completely free. 4. Beauty Color Code. FREE. Click on any color to see complimentary, analogous, triadic, tints, shades, and more. 5. Mudcube. FREE. More fun to play with than with actually generating a color scheme. But still fun to see color groups. 1. Microsoft OneNote. FREE for Mac users, not sure about Windows. I use OneNote as my digital notebook to keep a ton of stuff organized. 2. Evernote. FREE for basic, $7.99/month for premium. The other big note-taking app. Organize your notes, copy images, videos, and more. 3. Numbers or Excel. Price depends upon computer and if it comes with. I use Numbers (which is free on my Mac) to organize my posts. I have a spreadsheet designed that has columns for: title, url, SEO, pin url, date shared on: facebook, instagram, yummly, reddit, pinterest personal boards, pinterest group boards, tailwind tribes. I highly suggest setting up a spreadsheet from the beginning to keep notes on your posts. If you want to be super-organized, I also have a spreadsheet for seasonal content with all the appropriate post information organized by season so it’s easy to re-share holiday/seasonal content. I included a section for very popular evergreen content so I don’t forget to re-share that regularly also. 4. Mindmeister. FREE for basic, $4.99/month for personal. Tool to help you with mind-mapping, mapping out funnels, etc. I’m going to try them out for my next sales funnel! 5. Asana. FREE for basic, $9.99/member/month (billed annually). Perfect software if you’re coordinating stuff with a team. 6. Trello. FREE for basic, $3.75/month (billed annually) for premium. Organizational software. Highly recommended by others, but I didn’t really want to switch over all my stuff from my current system. 7. MeisterTask. FREE for basic, $8.25/user/month for pro. Excellent for team coordination. 8. Dropbox. FREE to $20/user/month, depending on how much storage you need. Remote backup/storage drive to share files with others. I use this to transfer stuff between my computer and other devices a lot. A lot of blogs also host their free printables on dropbox. One of the keys to grabbing reader’s attention is successful graphics. So I decided to dedicate an entire section just to images/graphics. After all, readers are the key to a successful blog! 1. For an absolutely exhaustive list of free and paid resources, I did two posts: Where to Find Free Images: 75+ Best Places for Free Photos and Where to Find Graphic Designs (some free!). (No, I’m not going to list all of the hundreds of places between the two articles in this post…please click on the appropriate post whether you’re looking for images or graphics! If I listed them all the title of this article would be “200+ Fabulous Resources”…haha). 2. The Hungry Jpeg Freebies page. FREE. Hundreds of free graphics, svg files, fonts, and more. 3. Design Bundles Free Resources. FREE. Mostly graphics and svg, but also some mock-ups and fonts. 4. Deal Jumbo Freebies. FREE. Hundreds of free fonts plus a few other graphic designs. 5. Creative Fabrica Freebies. FREE. Eclectic mix of fonts, doodles, clip-arts, graphics, icons, and more. But all free. 6. Creative Market Weekly Freebies. FREE. Weekly bundle of six freebies, including graphics, mockups, brushes (I’ve gotten some great brushes! ), fonts, and more. Once you have images, there is quite a bit to putting them together. 7. I use Adobe Photoshop and Lightroom. $9.99/month for the photography bundle which includes both programs. 8. PicMonkey. Free trial, then $5.99/month. If you don’t want to learn Photoshop, quite a few bloggers use PicMonkey to make their pin images. 9. Canva. FREE for basic, $9.95/month (billed annually) for premium. If you don’t want to pay anything at all, you can use Canva to create your images. I know a ton of bloggers who do that. I prefer Photoshop (not to mention the ability to easily edit old photos/images instead of starting from scratch), but know a lot of people who use Canva. 10. Stencil. FREE for up to 10 images/month, $9/month for pro account. Another big image creation site. For the widest variety of images and icons, you’ll want to go with the pro account. This allows you to keep up to 100 images saved with them. For a few more dollars a month, you can save unlimited photos with them. 11. Piktochart. FREE for basic, $12.50/month (billed annually) for Lite plan, more for pro and pro plus. It’s like PicMonkey or Canva, but just for infographics. If you find yourself struggling with creating infographics, here is the resource for you! 12. How to Create the Perfect Pin Images. FREE. Article by me compiled with the advice and help of other bloggers. 1. 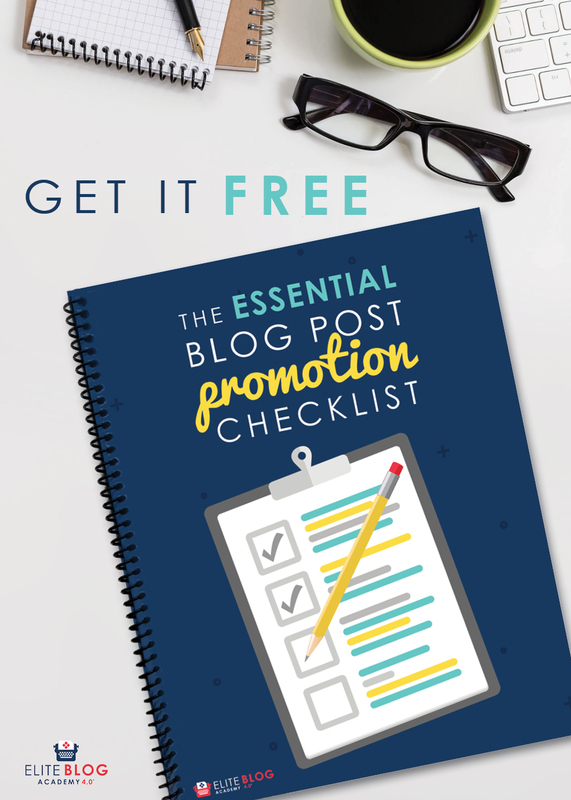 Essential Blog Promotion Checklist. FREE. Free printable about exactly where you should be promoting your blog. 2. Blog Post Checklist. FREE. Free printable and blog post about what to include in every blog post. 3. Keyword Finder by Mangools. FREE for five searches per day, $29.90/month for basic plan. I use the paid plan because I do a lot more than five searches some days! And this keyword planner is amazing. Just click the link to watch a short video on the amazing stats they provide. 4. Keyword Planner by Google. FREE. Not as detailed of stats, but a basic (if bulky to use) way to do some keyword research. 5. How to Choose Keywords. FREE. Quick article on how I go about checking keywords. It’s by me, so not sure if this counts as a resource or not? Runs through how to use both Google and Pinterest searches to help you focus in on a golden keyword and related keywords. 6. Keywords Everywhere. FREE. Extension for Chrome or Firefox that shows search volume and CPC for search terms when you search on Google. 7. Ubersuggest. FREE. Another keyword planner. Unlike the others (except for Keyword Finder, which is a paid plan), it gives you difficulty of the keyword you want to rank for. 8. Moz Keyword Explorer. FREE for 10 searches per month, $79/month (billed annually) after that. You might remember Moz from checking your DA for free up above. You can also use them to check keyword search volume. 9. Grammerly. FREE for basic, 11.66/month (billed annually) for premium. I don’t personally use it, but I’ve heard good things about. Check your grammar before posting! 10. Hemingway Editor. FREE. I use the Hemingway “app” (you can use it on your desktop). It’s amazing! It helps me clean up those endless run-on sentences. Just copy and paste your text into their window and it gives suggestions. 11. CoSchedule Headline Analyzer. FREE. Input your headline and it will give you a score, letting you know what to improve. 12. Blog Title Generator. FREE. More for fun than coming up with actual titles, if you’re in a rut, this might help. Just type in what you’re blogging about and hit ‘next’…it will generate some titles for you to consider. 13. HubSpot Blog Idea Generator. FREE. Again, more for fun than coming up with actual ideas…but if you’re in a rut seeing some cute ideas might help. 14. Portent Content Idea Generator. FREE. Again, more for fun. But comes up with some crazy stuff! You just might build on one of their ideas. 15. Buzzsumo. FREE to $80/month. Search for your potential blog headlines and see how others are performing. Also see what the competition is and how you can make yours better. 16. 10 Steps to Take When a Blog Post Goes Viral. FREE. PDF on what exactly to do when a blog post goes viral. 17. 120 Blog Post Ideas. FREE. 1. ConvertKit. $29/month, up to 1,000 subscribers. Prices scale up from there. This is who I use and my number one recommendation (despite the price). In fact, I love them so much I’ve done two articles on them that you might find interesting: Why I Invested in ConvertKit (Even When I Wasn’t Making Money) and How to Set-up ConvertKit: The Ultimate Guide. I’m currently at 6,000 subscribers (but it grows by over 100 a week, so that number will be incorrect by the time I hit the publish button) and planning on sticking with ConvertKit until at least 50,000. Then I might switch to Drip. 2. MailChimp. FREE up to 2,000 subscribers. I do not recommend them. But if you want a free e-mail service, this is where to start. But as I said, they’re not my favorite. 3. MailerLite. FREE up to 1,000 subscribers, $10/month up to 2,500 subscribers. Prices scale up from there. This is the other big e-mail service used by bloggers in the beginning to intermediate stage. (I consider myself intermediate, in case you were interested). 4. Drip. $99/month up to 5,000 subscribers, contact them for higher. If you’re already a major blogger and looking to upgrade your e-mail service, I’ve heard very good things about them. I haven’t taken this step yet. 5. LeadPages. $25-$199/month (billed annually). The industry standard when it comes to landing pages. I haven’t used them personally yet (I still build my own because the price is prohibitive for me at this point). 6. Sumo. Free for basic, $29-$79/month for premium services. Allows you to create pop-ups, welcome mats, etc. on your website. I haven’t used them yet, but they’re a big brand and used widely by bloggers. 1. Tailwind. Price: $9.99/month, but can “powerup” to have access to more tribes (which I highly recommend). I have a post on how to maximize Tailwind: All The Features You Need to Know. Tailwind has saved me so much time and increased my Pinterest reach so much through tribes that I cannot emphasize enough how important Tailwind is. I just started using them for Instagram too since they do auto-posting! Yay! 2. Buffer. FREE for queue up to 10, $15/month for more. Scheduling tool for Twitter, Pinterest, Instagram, and Facebook. 3. Um, these are kind of obvious. But have a social media presence on Facebook, Pinterest, and Instagram for sure. Maybe Twitter, Reddit!, or others if you’re interested and your market is there. 4. Bitly. FREE. Tired on long URLs? Try out Bitly. 5-8. There are a TON of social media schedulers out there. I haven’t tried them all (or even most of them), but you can read reviews all over the place. Common ones are Post Planner (starts at $3/month), HootSuite (starts at $29/month), Meet Edgar (starts at $49/month), CoSchedule ($20/month)and more. Right now, I’m using Tailwind for Pinterest and Instagram. I schedule my Facebook using the Facebook scheduling option (I’ve heard they give priority to posts scheduled using their scheduler directly rather than 3rd-party). Should I expand more, I might start investigating these others. 9. Co-Schedule Social Media Message Optimizer. FREE. Test out different headlines and descriptions and see how they work on various social media channels. Yes, you knew this section was on here. But I’ve taken a TON (I’ve subscribed to the Genius Blogger’s ToolKit for three years and taken almost every class offered each year even remotely related to my stuff) of courses, read books, and browsed blogs. And the list of what I recommend is SHORT. 1. Sticky Blogging Masterclass and Sticky Blogging SEO. That link should take you to a free class or workshop (whatever she is offering right now). The classes only open up certain times of the year, but hop on over and check them out. They’re amazing. I’m ranked #1 on Google in multiple search terms because of her class! 2. Elite Blog Academy. Again, only open certain times of the year. But click on the link to learn more and get added to the waiting list. 3. Ultimate Bundle Genius Bloggers Toolkit. Only available certain times of the year. This is a yearly bundle of resources- it changes every year- that is amazing! Some are better than others, but I’ve never not been 100% satisfied with the small amount of money invested for the massive amount of learning. 5. Basic SEO Course by Moz. FREE. Yep, Moz again. If you’re wondering what the term SEO even means and why it matters, this course is where to start. 6. HubSpot Learning Center. FREE. They have a ton of different learning programs/little classes. I haven’t actually tried any of them yet, but they look interesting. I’ve only done one giveaway on my site, but planning on doing more. You can get the basic features for free at multiple sites. But for the spiffy stuff- such as promotion, extra entries for sharing with friends, and stuff, you have to pay. 1. Rafflecopter. FREE to $84/month, depending upon how many features you want. 2. Kingsumo. FREE to $198/lifetime, depending upon how many features you want. I’ve also heard Giveaway Tools and Gleam recommended, but I haven’t dealt with either one. If you have feedback, let me know! I’m always trying to improve my posts. 1. The Simple Pin Podcast. FREE. Dedicated to the ever-changing world of Pinterest. 2. Just Keep Blogging Podcast. FREE. Dedicated to everything blogging and motivating you when you feel like throwing in the towel. I’ve had a ton of blogger friends recommend it, including a fellow EBA member over at RehearsingRetirement.com. 3. Food Blogger Pro Podcast. FREE. Dedicated to food blogging. 4. 10 Days to Better Shopify Store. FREE. 10-post series about how she has an amazingly successful Shopify store. I didn’t know about this one until a fellow EBA blogger over at MyCulturedPalate told me about it. 5. 15 Mobile Apps Every Blogger Needs. FREE. 6. Secret Blueprint to Blogging Success. FREE. A step-by-step guide on how to build long-term success. While you might be making money off of ads and sponsored posts, a lot of bloggers also have their own products, courses, classes, etc. 1. PayPal. Free to make account. Fees vary by transaction. About half of my customer pay via PayPal. 2. Stripe. Free to make account. Fees vary by transaction. The rest pay via credit card via Stripe. 3. SendOwl. Price: approximately $9/month. Plus fees on every transaction (but the fees are from Paypal and Stripe, not additional by SendOwl). While I’m still small, I’m using SendOwl. Their fees are minimal, it’s easy to use, and easy to integrate on my site. This is best for digital products. 4. Shopify. Price: $29/month. Plus fees on every transaction. Works for both digital products and physical products. 5. WooCommerce. FREE. This is a plug-in that allows you to set up a shop on your site. And while it’s free, that means coding and set-up on your part. I’ve heard both good and bad things about it. I went with SendOwl even though it cost money to avoid the pain of coding. ~You can also try GumRoad, but I haven’t had any experience with it, so I’m not going to recommend them as a resource! 6. Teachable. Price: Starts at $39/month. Plus fees on every transaction. Best and widest used software for delivering courses to students. 7. 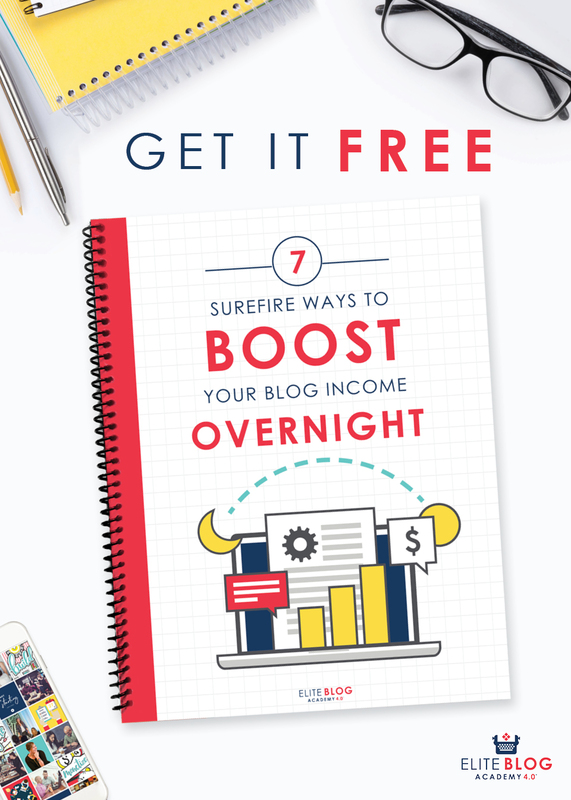 7 Surefire Ways to Increase Your Blog Income Overnight. FREE. Small pdf on how to increase your income. 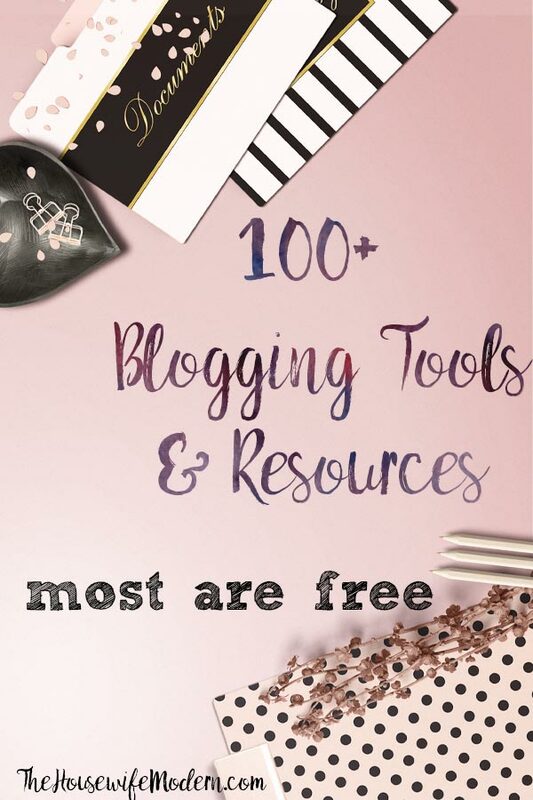 I have a few tools and resources for blogging that just don’t fit anywhere else, category-wise! So forgive this section. 1. Da Button Factory. FREE. Make buttons for your website. 2. HTML to Plain text. FREE. Cut out any background formatting and get plain text. I actually have an app on my MacBook I use, but found one online for you guys. 3. Nofollow Extension for Google Chrome. FREE. All nofollow links will be outlined in red in Google Chrome once you install this. Easy way to check and make sure that any sponsored posts links are properly showing as nofollow. 4. PDF Escape. FREE. Create fillable forms on your PDF. Guess what? I’m still learning about blogging! I want YOU to share you favorite resources in comments section. In particular, I’m still looking for quiz builders, infographic builders, where you set up your shops, legal info, and video creation. But I’ll take any and all resources that you find useful. Leave your web address and if I add your resource to my list, I’ll include a link to your site!